As some expected, Apple's latest iOS 8.1 beta build contains assets for the upcoming Apple Pay mobile payments service, including hidden settings menus and references to an iPad with Touch ID fingerprint recognition. 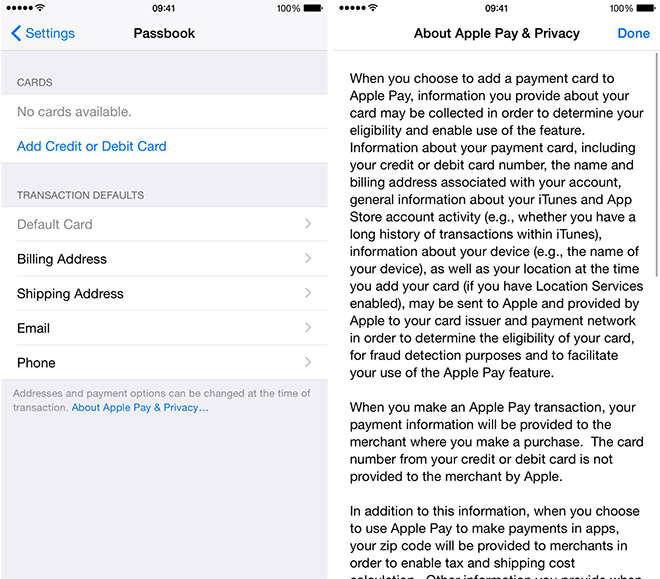 Developer Hamza Sood uncovered the Apple Pay settings menu pane in the latest iOS 8.1 beta shortly after the upcoming maintenance update was released on Monday. As seen in the screenshot above, Apple Pay will be managed through the Passbook settings menu in iOS 8. Along with adding and removing credit card information, the settings pane reveals Apple will also store default transaction details like a go-to credit card, billing address, shipping address, email and other data normally requested by retailers. In addition to the Apple Pay findings, Sood discovered a string of code that references Touch ID-enabled iPads, a device enhancement long-rumored to be coming to Apple's tablet lineup. The string reads, "Pay with iPad using Touch ID. With Apple Pay, you no longer need to type card numbers and shipping information." The developer later clarified that the iPad Apple Pay reference is in regard to the payment system's online functionality, not necessarily the NFC-enabled embodiment lying dormant in the iPhone 6 and 6 Plus. Apple Pay is slated to roll out in October as Apple's first foray into the digital wallet sector. A touchless solution based on NFC technology, Apple Pay uses Touch ID authentication, secure enclave storage and tokenized payment methods to interface with point-of-sale terminals at select retail outlets. At launch, some 220,000 locations will accept Apple's new payment system.